Gallium is a bright blue-silver metal with a melting point low enough you can melt a chunk in your hand. Here are interesting facts about this element. Properties: Gallium has a melting point of 29.78°C, boiling point of 2403°C, specific gravity of 5.904 (29.6°C), specific gravity of 6.095 (29.8°C, liguid), with a valence of 2 or 3. Gallium has one of the longest liquid temperature ranges of any metal, with a low vapor pressure even at high temperatures. The element has a strong tendency to supercool below its freezing point. Seeding is sometimes necessary to initiate solidification. 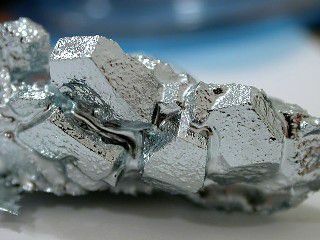 Pure gallium metal has a silvery appearance. It exhibits a conchoidal fracture that it similar to a glass fracture in appearance. Gallium expands 3.1% on solidifying, so it should not be stored in a metal or glass container that can break upon its solidification. Gallium wets glass and porcelain, forming a brilliant mirror finish on glass. Highly pure gallium is only slowly attacked by mineral acids. Gallium is associated with a relatively low toxicity, but should be handled with care until more health data has been accumulated. Uses: Since it is a liquid near room temperature, gallium is used for high-temperature thermometers. Gallium is used to dope semiconductors and for producing solid-state devices. Gallium arsenide is used to convert electricity into coherent light. Magnesium gallate with divalent impurities (e.g., Mn2+) is used to make commercial ultraviolet-activated powder phosphors. Sources: Gallium may be found as a trace element in sphalerite, diaspore, bauxite, coal, and germanite. Flue dusts from burning coal may contain as much as 1.5% gallium. The free metal may be obtained by electrolysis of its hydroxide in a KOH solution. Isotopes: There are 27 known isotopes of gallium ranging from Ga-60 to Ga-86. There are two stable isotopes: Ga-69 (60.108% abundance) and Ga-71 (39.892% abundance). Gallium's discover, Paul-Emile Lecoq de Boisbaudran named the element after his home country France. The Latin word 'gallus' means both 'Gaul' which is an older name for France. It was believed he also named the element after himself because gallus also means 'rooster' (or Le Coq in French). Lecoq later denied he named gallium after himself. The discovery of gallium filled a spot predicted by Mendeleev's periodic table. Gallium took the place of the placeholder element eka-aluminum. Gallium was first identified using spectroscopy by its distinct pair of violet spectral lines. Gallium's melting point (302.93 K) is low enough to melt the metal in the palm of your hand. Gallium is the element with the highest range of temperatures for its liquid phase. The difference between gallium's melting and boiling point is 2373 °C. Gallium is one of five elements with a melting point near room temperature. The other four are mercury, cesium, rubidium and francium. Gallium expands as it freezes like water. Gallium does not exist free in nature. Gallium is obtained as a byproduct in the production of zinc and aluminum. Most gallium produced today is used in electronics. Gallium nitride semiconductors are used the blue diode lasers of Blu-ray™ players. Gallium arsenide is used to produce ultra-brite blue LEDs. Liquid gallium is known for its ability to wet glass, porcelain and skin. Gallium forms a very reflective surface on glass making an excellent mirror. An amalgam of gallium, indium, tin is used in medical thermometers in place of the more traditional and toxic mercury thermometers. "Gallium Beating Heart" is one of the fun and easy chemistry demonstrations for chemistry students. de Boisbaudran, Lecoq (1835–1965). "Caractères chimiques et spectroscopiques d'un nouveau métal, le gallium, découvert dans une blende de la mine de Pierrefitte, vallée d'Argelès (Pyrénées)". Comptes rendus. 81: 493.